I was surrounded by wonderful cooks as a child, but, surprisingly, my mother was not one of them. She was charming and witty and blessed with a wonderful sense of adventure, but she was not a homemaker. She viewed food as fuel that was to be quickly made and consumed. She had no sense of why anyone might spend hours coaxing a dish to perfection when it would disappear in minutes once set on the table. Mama never realized that those meals made in the neighbor's kitchens fed both body and soul and carried with them a history that tied the old world to the new. Her own childhood, especially the latter parts of it, was a study in the vaguaries of fate. She was a Mayflower Yankee and the child of a lumber baron who was "ruined" - her words not mine - in the Great Depression. These New England Yankees, rich or poor, generally had simple tastes in food. I knew what day of the week it was by what appeared on my mother's dinner table. Sunday was boiled dinner and Wednesday was fish chowder made from dried or frozen cod. Always. There was a time I vowed I'd never eat cod fish again. I was, of course, infirm of purpose. I loved cod cakes and and a well-made fish stew, and when the Silver Fox and I moved to the East coast, I was introduced to the glorious simplicity of baked or broiled cod fillets. I stopped by the fish market today and they had just received a shipment of fresh cod. I brought home enough to make fresh cod cakes which I'll explore later in the week, as well as gorgeous fillets to bake for our dinner tonight. Most of the restaurants that pepper the shore towns of the Jersey coast are Italian, so it should come as no surprise that my fillets are what we call "oreganata". 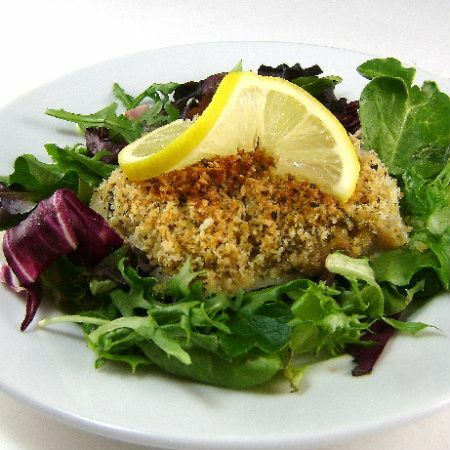 They are lightly covered with crumbs that contain oregano, garlic and cheese and then baked until the fish flakes and the crumbs are a golden brown. Hopefully, those events occur simultaneously. If not, remember God created broilers for a reason. I suspect most of you already have a recipe for baked or broiled cod, but on the odd chance there are still some who need a recipe I thought I'd share mine with you. The recipe defines simplicity and is next to no work to execute. If you can get fresh cod I know you'll enjoy this. Here is my recipe for baked cod oreganata as it's made by almost every restaurant at the Jersey shore.